I can hardly claim to be an “expert” on any cuisine, but based on my family name, my travels, and my resume, I am at least familiar with a lot of what Italian and French cuisines have to offer. Not Spanish food, though. Spain is a bit of a mystery. I’ve been there, but it was brief and at the end of months living abroad on a student budget. Sure, I remember having churros con chocolate (life-changing, obviously) and paella but my funds and timeframe didn’t allow me to dig in much beyond that. That being said, I like to imagine if I’d stayed a little longer, turned a few more corners, stepped into a couple more restaurants, and eaten a few more dinners, I might have had something like this: a tomatoey clam, chickpea, and Chorizo soup, scented with smoked paprika and plenty of garlic, served with crusty, crunchy bread and saffron aioli. Perhaps? I’d like to think so. 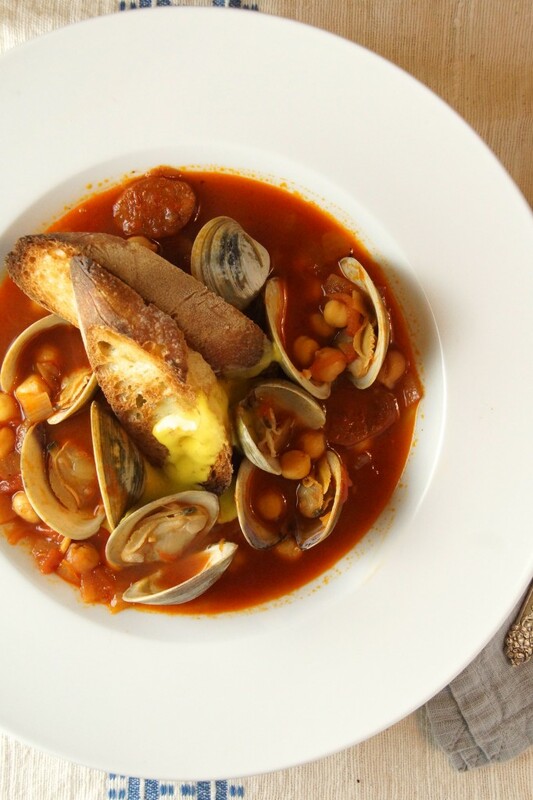 Authentic or imagined, this is one tasty soup. It’s also incredibly easy, quick to make, and doesn’t call for a ton of fussy ingredients. Can of chickpeas, can of tomatoes. 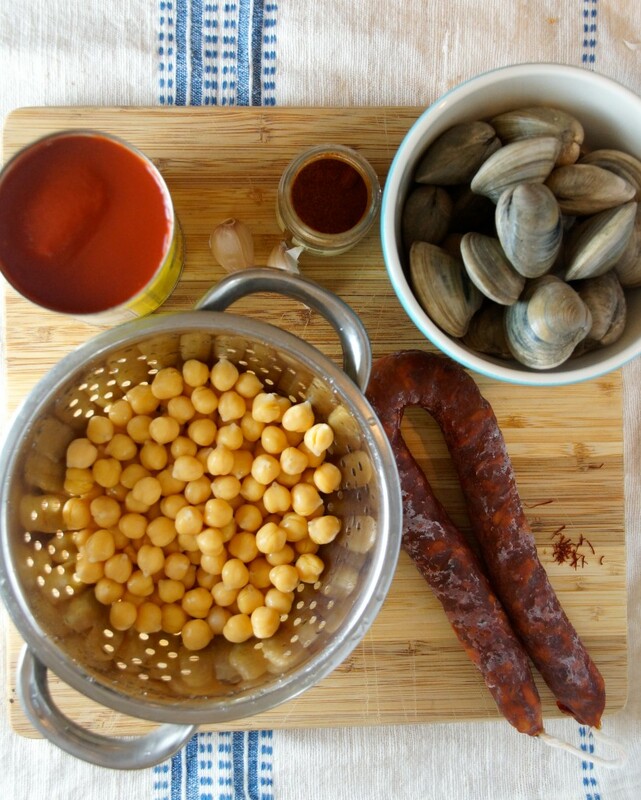 Clams, some Chorizo sausage. Smoked paprika, garlic, and saffron. Grab a bottle of white and an onion and we’ll get to cookin’. Sauté some onion and garlic in olive oil. 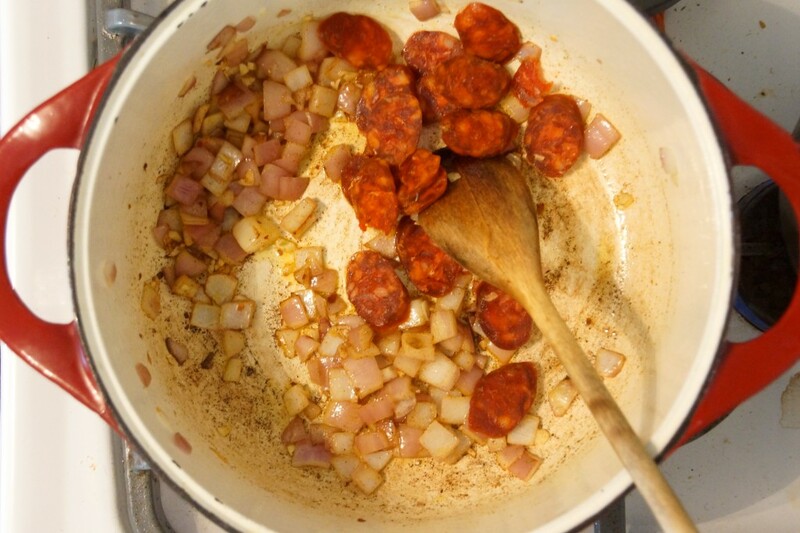 Add smoked paprika and Chorizo. Mmm…it’s going to be good. White wine, chickpeas, crushed tomatoes get added. Let everything simmer and meld, then toss in the clams. Cover the pot until the shells pop open. 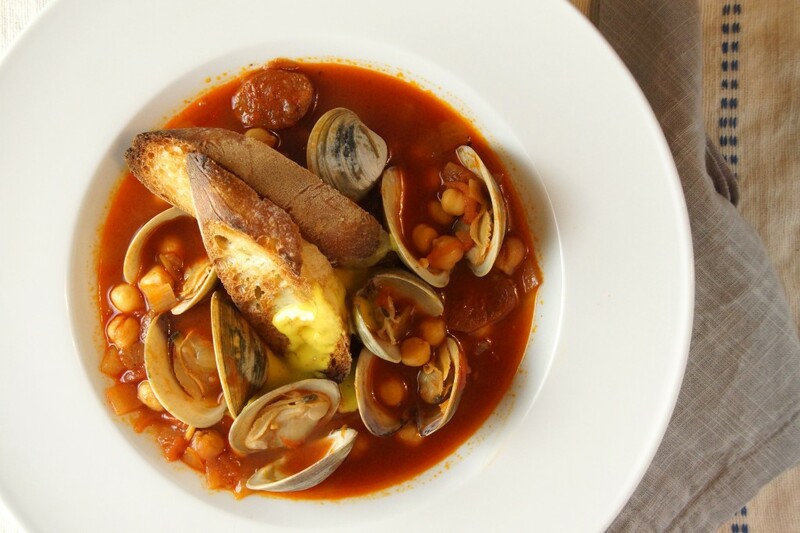 While you wait on the clams, toast some bread and whisk up a little aioli. It’ll take this soup from good to great and you’ll get a mini-arm workout in the process. Rub a smashed clove of garlic around a bowl. 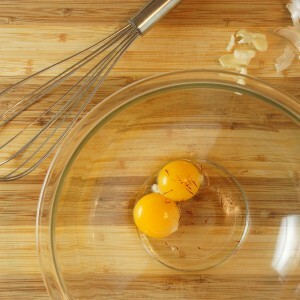 Whisk together 2 egg yolks, a dash of salt, and a pinch of saffron threads. Call your dinner partner over to drizzle olive oil into the bowl while you keep whisking. 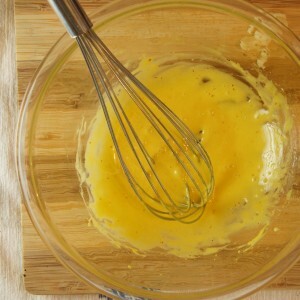 Keep whisking and drizzling until you have a thin, bright yellow mayonnaise. Add a squeeze of lemon and you’re done. Ladle up the soup, top it with toasted bread, and spoon on the aioli. File this one away under Spanish, Imagined, until you make it back to Spain and can confidently have a Spanish tab in your recipe file. In the meantime, slurp this soup up, and thank goodness for your wandering mind. If you prefer stew to soup, add a few sliced fingerling or Yukon gold potatoes and shredded kale when you add the chickpeas. Heat about 2 Tbsp. olive oil over medium-high heat in a large, heavy pot. Sauté onion until translucent, about 2 minutes. Season lightly with salt. Add garlic, sauté until fragrant, about 1 minute. Add smoked paprika, Chorizo, and red pepper flakes, to a clear spot. Briefly sauté, then stir and combine. Add white wine, bring to boil and allow most to be absorbed. Add chickpeas, crushed tomatoes, and stock. Bring to a boil, then reduce to a simmer. Simmer for 15-20 minutes until the flavors are unified. Add the clams. Cover the pot until the clams have opened, 5-8 minutes. Taste and season as necessary with salt and pepper. Meanwhile, rub the smashed garlic around the inside of a bowl and discard. Add the egg yolks to the bowl along with the saffron and a pinch of salt. Whisk together until thick and yellow. Slowly drizzle in the olive oil while whisking to create an emulsification. It is helpful to have another person adding the oil while you whisk. Start by just adding a drop or 2 at a time and then add the rest in a slow, thin stream. For this application, I prefer a thin, saucy aioli to a heavier, more mayonnaise-like aioli. If you prefer the latter, just add more oil and keep whisking. Taste. Season with additional salt if needed and a squeeze of lemon juice. Divide the soup between warm bowls. Place toasted bread in the center of each bowl and spoon the aioli over the top. 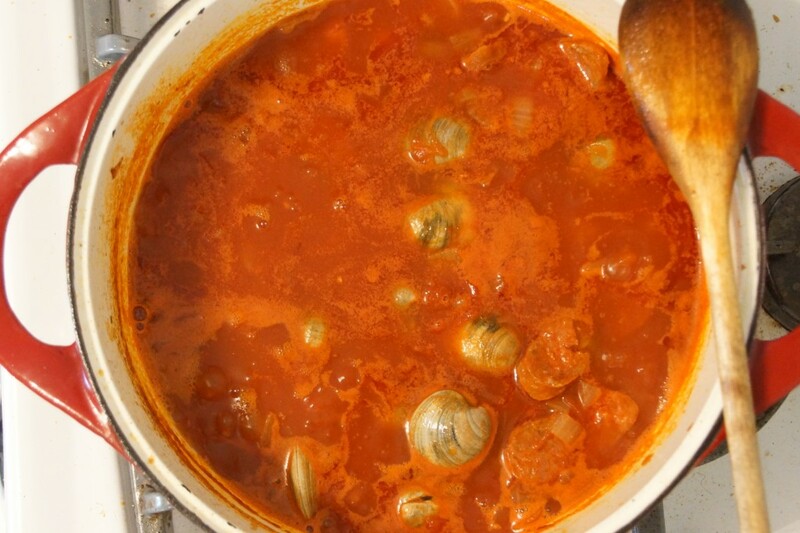 If you are like me, you certainly won't have any leftover clams but you may have some of the good, tomatoey broth left over. Use this as a flavor base for rice or saucing pasta to quick start your next dinner. This looks really good, Sarah. I will try it soon! You should- it’s really delivers on flavor and couldn’t be easier to make. Thanks! 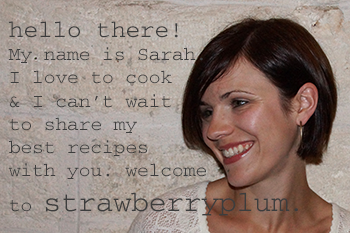 And thanks for turning me on to Whole Yum; I will definitely be submitting recipes. Oh, wow. I can’t tell you how much I cannot wait to make this! It looks AMAZING! Thank you for sharing such a beautiful recipe and beautiful photos! So happy to have found your site!